by Jason M. Stewart Editor · Steven C. Hayes Author of introduction, etc. If you are a psychodynamic therapist interested in the growing mindfulness movement, you may be looking for resources to help you enhance your practice. More and more, professionals in the psychodynamic tradition are finding that mindfulness exercises help their patients connect with the moment and discover the underlying causes of their fears and anxieties. This groundbreaking book spotlights the similarities between these two therapeutic approaches, and shows how mindfulness in the present moment, acceptance of internal experiences, and commitment to one's values are implicit elements of psychodynamic psychotherapy. 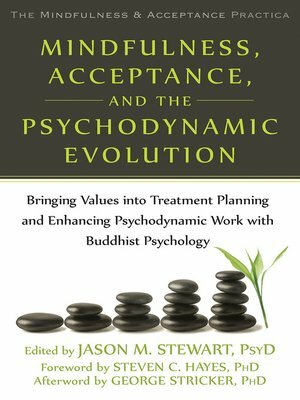 In this much-needed volume, psychologist and editor Jason M. Stewart offers a unique perspective on client treatment that fuses psychodynamic psychotherapy, mindfulness and acceptance-based approaches, and Buddhist psychology. Using the insights in this powerful resource, you will help your clients gain greater psychological flexibility, connect with their values and goals, and create a life that is purposeful, meaningful, and vital. Recent research supports the effectiveness of both psychodynamic and mindfulness-based processes in contributing to success in psychotherapy. This book does not suggest that mindfulness practice can take the place of psychodynamic therapy. Rather, it offers powerful, evidence-based strategies to help you enhance your practice. If you are ready to take your practice to the next level, this book will be your guide.